A quick pic after our session at the Scribblers Festival. Meeting Chris Riddell was a great opportunity. It’s not often you are handed a portrait of yourself during an interview! UK Children’s Laureate 2015-17, illustrator of over 100 books and political cartoonist, the man needs no introduction to anyone who’s browsed through a children’s book shop in the last 20 years. 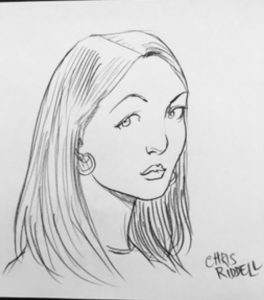 I’ve sought out Chris’s illustrations frequently since I bought the Edge Chronicles series for my boys in about 2000. It’s impossible not to be pulled in by the detail, the sweeping majesty and expression of his work. I hadn’t realised he has been a political cartoonist for decades, and consistently with the Observer of London since 1995. He says it’s an easy relationship drawing for a left leaning publication and certainly doesn’t hold back his disgust for politicians like Thatcher, Cameron, May and Trump. 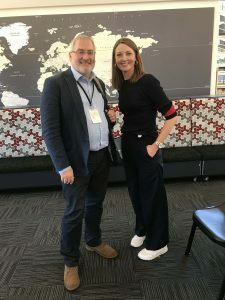 I chatted with him yesterday in front of a group of senior school students for the inaugural Scribblers Festival – a children’s literature festival started by Katherine Dorrington, former program director of the Perth Writers Festival. I’ll be honest and say he did not need me there – he works by drawing as he talks, using a visualiser, which projects the drawings as he creates them. His commentary leapt from British politics to Australian politics to pithy observations about people he’s met during his lengthy career. The student – and I – were enthralled. The Scribblers Festival will be back next year – please support them!